We love castle weddings in France! Each countryside chateau is different and has its own unique atmosphere. Chateau Belle de Vie in Gascogne has beautiful Cypress trees, an ancient stone wall, its own turret, and is surrounded by acres of vineyards and sunflower fields. Inside the Chateau, luxurious rooms are filled with with 16th century artwork and other antiques. 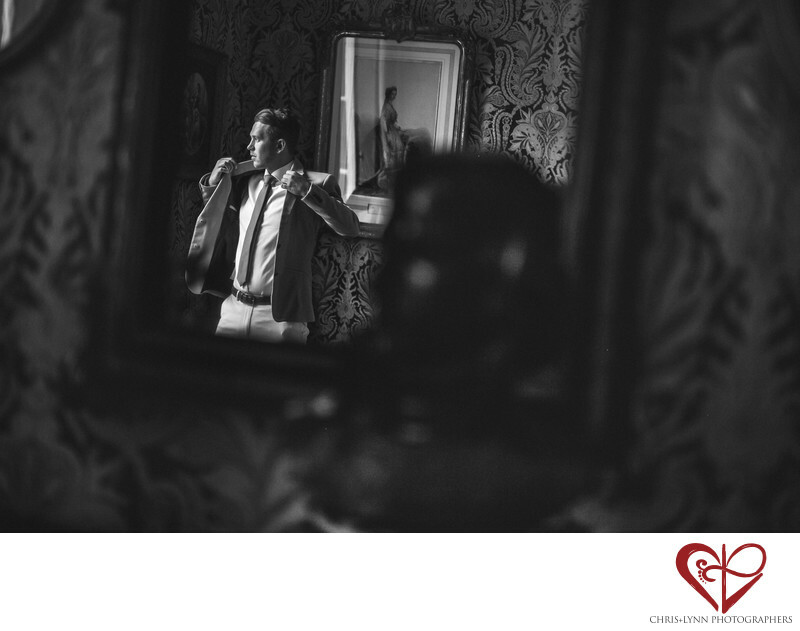 This image was created when the groom was doing the final preparations before heading to the garden for the wedding ceremony. The room he got ready in was quite dark & somber but skylight coming in from the large paned windows created some dramatic lighting as he put on his jacket. We chose to shoot this moment as a reflection in the mirror to include the patterned wallpaper on the walls, the painting in the gilded frame and a hint of the stone bust on the armoire - each elements distinctive to the Chateau they chose as their location for their destination wedding. More images from this British couple's Chateau Malliac wedding can be found in the Featured Wedding section of our website here. This Bordeaux country wedding was also featured on the French Wedding Style blog here. Location: Chateau de Malliac, France. 1/2000; f/1.4; ISO 800; 50.0 mm.